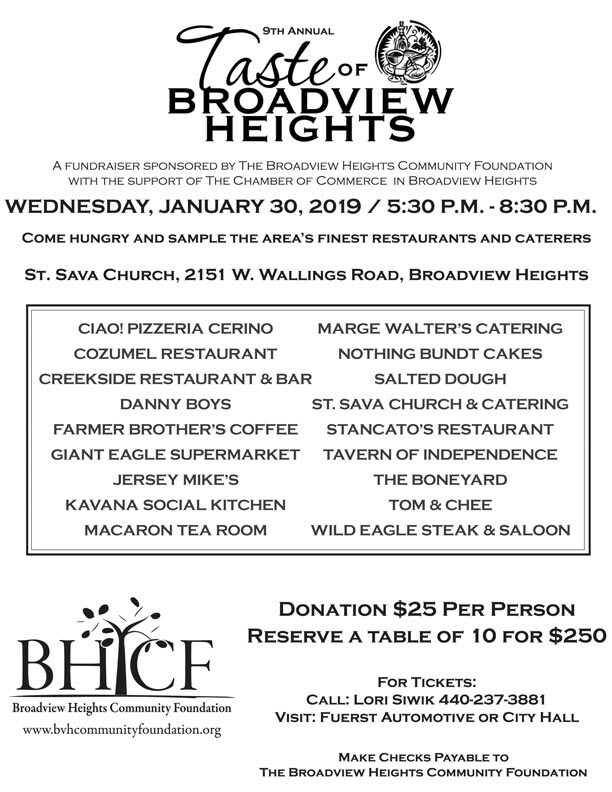 The annual Taste of Broadview Heights, sponsored by The Broadview Heights Community Foundation will be held on Wednesday January 30, 2019 at St. Sava Church from 5:30 p.m. to 8:30 p.m. The event is one of the biggest events in Broadview Heights every year. Seventeen local restaurants and caterers will showcase their culinary talents. Musical entertainment and raffle baskets will be a part of the event. The restaurants and caterers participating include: Cozumel, Creekside Restaurant, The Boneyard, Farmer Brother’s Coffee, Wild Eagle Steak & Saloon, Salted Dough, Macaron Tea Room, Tavern of Independence, Ciao!Pizzeria Cerino, Nothing Bundt Cakes, Kavana Social Kitchen, Giant Eagle Supermarket, Marge Walters Catering, St. Sava Church and Catering, Jersey Mike’s, Tom & Chee, and Stancato’s Restaurant. Each of the caterers and restaurants will donate samples from their menus for the attendees to enjoy. Craft beer and fine wine, along with soft drinks, is included in the ticket price. Tickets can be purchased at City Hall or at Fuerst Automotive. Tickets are $25 per person. A limited number of tables of 10 can be reserved. Money raised from The Taste of Broadview Heights will be used to support events in the city as well as the construction of a pavilion at Broadview Center. Over the years, the Foundation has donated over $45,000 to benefit the residents of Broadview Heights. 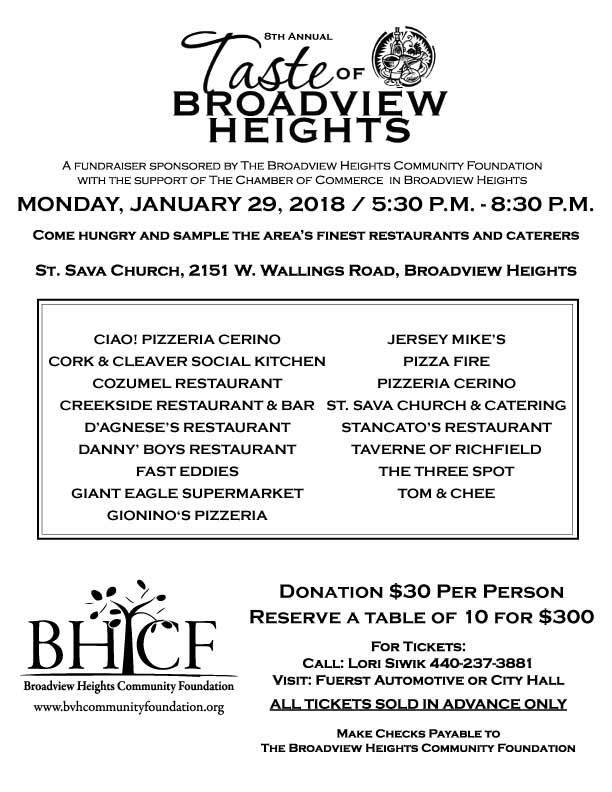 The Broadview Heights Community Foundation is a qualified non-profit organization created by leading community members having the common interest to improve the quality of life in the City of Broadview Heights for the benefit of the residents. The purpose of the Foundation is to assist donors in building an enduring source of charitable funds to meet the changing needs and interests of Broadview Heights for its residents. Reception at 6:30 PM prior to the show, dessert at intermission, and a non-alcoholic Beverage Bar. purchased at Fuerst Automotive at Broadview & Wallings. cast includes Chris Bizub, Elizabeth Allard, and Eli Ravenson. Technical Direction by Tim Anderson.